If the Democratic presidential primary were held today in your state, whom would you support? Gore’s choice is the least-favored candidate by the corporate media—Dennis Kucinich, and it hardly could be otherwise. For the past two years I’ve been crisscrossing the United States speaking to crowds of people about our history and politics. At the same time, would-be Presidents of the greatest nation in the country, as silver-tongued Spiro Agnew used to say, have been crowding the trail, while TV journalists sadly shake their heads at how savage the politicos have become in their language. But then, it is the task of TV journalists to foment quarrels where often none properly exist. As I pass through the stage door of one auditorium after another, I now hear the ominous name of Darth Vader, as edgy audiences shudder at the horrible direction our political discourse has taken. Ever eager as I am to shed light, I sometimes drop the name of the least publicized applicant to the creaky throne of the West: Dennis Kucinich. It takes a moment for the name to sink in. Then genuine applause begins. He is very much a favorite out there in the amber fields of grain, and I work him into the text. A member of the House of Representatives for five terms since 1997, although many of his legislative measures have been too useful and original for our brain-dead media to comprehend. I note his well-wrought articles proposing the impeachment of Vice President Cheney, testing the patriotic nerves of his fellow Democrats, but then the fact of his useful existence often causes distress to those who genuinely hate that democracy he is so eager to extend. “Don’t waste your vote,” they whine in unison–as if our votes are not quadrennially wasted on those marvelous occasions when they are actually counted and recorded. Meanwhile, Kucinich is now at least visible in lineups of the Democratic candidates; he tends to be the most eloquent of the lot. So who is he? Something of a political prodigy: at 31 he was elected mayor of Cleveland. Once he had been installed, in 1978, the city’s lordly banks wanted the new mayor to sell off the city’s municipally owned electric system, Muny Light, to a private competitor in which (Oh, America!) the banks had a financial interest. When Mayor Kucinich refused to sell, the money lords took their revenge, as they are wont to do: they refused to roll over the city’s debt, pushing the city into default. The ensuing crisis revealed the banks’ criminal involvement with the private utility of their choice, CEI, which, had it acquired Muny Light, would have become a monopoly, as five of the six lordly banks had almost 1.8 million shares of CEI stock: this is Enronesque before the fact. Mayor Kucinich was not re-elected, but his profile was clearly etched on the consciousness of his city; and in due course he returned to the Cleveland City Council before being elected to the Ohio State Senate and then the US Congress. Kucinich has also written a description of his Dickensian youth, growing up in Cleveland. He has firsthand knowledge of urban poverty in the world’s richest nation. Born in 1946 into a Croatian Catholic family, by the time he was 17 he and his family had lived in twenty-one different places, much of which he describes in Dreiserian detail in a just-published memoir. 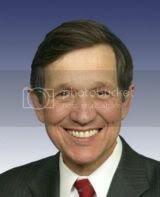 Kucinich is opposed to the death penalty as well as the USA Patriot Act. In 1998 and 2004 he was a US delegate to the United Nations convention on climate change. At home he has been active in Rust Belt affairs, working to preserve the ninety-year-old Cleveland steel industry, a task of the sort that will confront the next President should he or she have sufficient interest in these details. I asked a dedicated liberal his impression of Kucinich; he wondered if Kucinich was too slight to lead a nation of truly fat folk. I pointed out that he has the same physical stature as James Madison, as well as a Madisonian commitment to our 1789 Constitution; he is also farsighted, as demonstrated by his resolute opposition to Bush’s cries for ever more funding for the illegal wars in Iraq and Afghanistan. More to the point, in October 2002 he opposed the notion of a war then being debated. For those of us at home and in harm’s way from disease, he co-wrote HR 676, a bill that would insure all of us within Medicare, just as if we were citizens of a truly civilized nation. DISCLOSURE: It’s only fair to inform our readers that the editor of this publication, Patrice Greanville, the Associate Editor, Jason Miller, and the Editor at Large, Ed Duvin, are all supporters of Dennis Kucinich. The founding fathers foresaw the evil of party politics, and tried hard but vainly to keep America out of that rut, lost the battle after a few years, and since then, the choice of candidates put on the ballot has little to do with their abilities and their track record, but mainly to do with the number of times their faces have been smeared across the press and TV, with the choices of the monied interests, and with private decisions among the elite. This article by Gore just makes me very sad. The quality candidate is there, and available, and willing, and qualified, but the fix is already in, and the Democrats will decide the best candidate is a lady lawyer who sold and bought the same property six times in the same day, increasing the price each time by the legal maximum allowed, then finally sold it to the State of Arkansas, of which her husband was governor at the time. Her signature was on every one of the six documents, but try to find that fact on the Internet now! Only those with a long memory and a distaste for swindlers even recall what she did back then, so she’ll waltz into the nomination and probably the presidency on the back of party politics. PRAY FOR PEACE AND GOD BLESS US ALL……. God Bless Gore Vidal. As stated above, Kucinich has no chance. Ron Paul needs to select Dennis as his running mate. America’s last chance. Can we wake up the people? Either way it looks like rev. I liked Dennis, til he lied grieviously. He said he would not endorse a pro war canidate in the democratic party, in public in the debates. He enorsed Kerry a definate pro war canidate and he turned and endorsed Obama another two stepper. He introduced impeachment then voted to drop it. He is used to difuse a true left movement. He is just one of many pawns in the scheme of the capitlaist elite to keep their interests and select two party system in full control for their interests. If it hasn’t been noticed, well the stock yards are probably not far away, couple months to go . Can’t wait for the mind altering comercials.